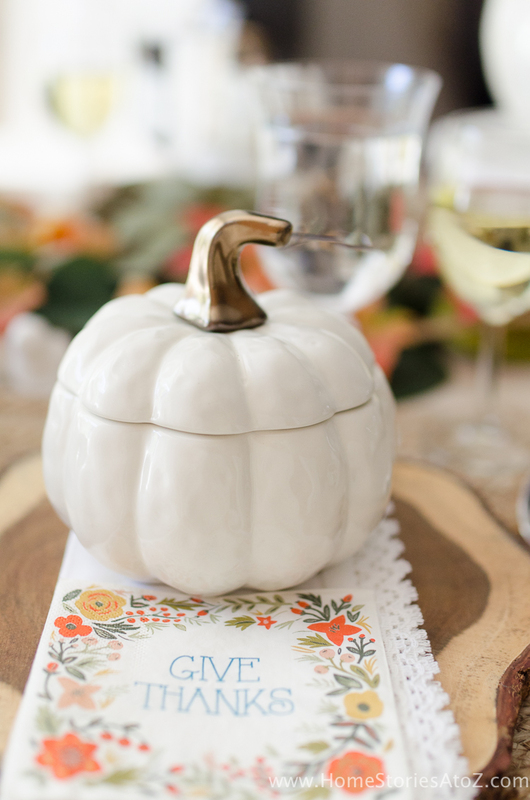 I’m so excited to share my Thanksgiving table table tips and fall table decorating ideas with you! 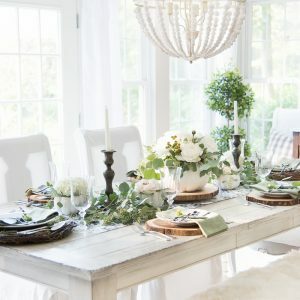 The best part of this table is that it features affordable Better Homes and Gardens products from Walmart. Yes, Walmart! Thanks to Better Homes and Gardens at Walmart for sponsoring this post and for creating amazing products at a Walmart price! Opinions, style-ideas, pictures, and words are my own. Post contains affiliate links. Fall is in full-swing here in Central PA. There is a chill in the air, the leaves are beginning to turn, and pumpkins greet you around every corner! 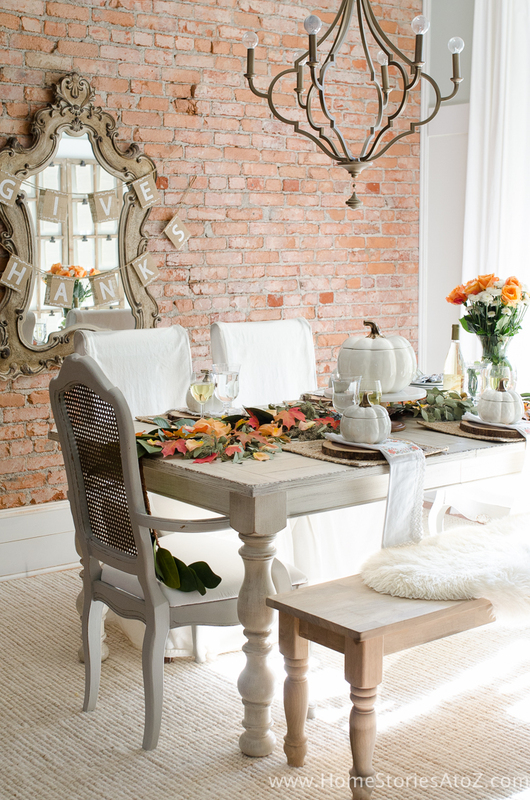 It’s a great time to begin thinking and planning for Thanksgiving which will be here before you know it. 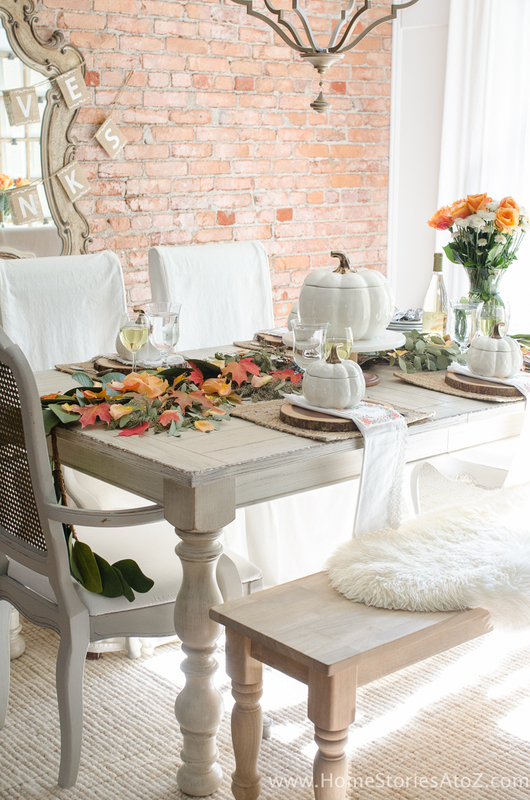 This month, Better Homes and Gardens challenged a few bloggers to create a beautiful fall tablescape using their product line at Walmart. I thought it would be fun to show you on a small scale what you can do on a grand scale for your Thanksgiving table this year. 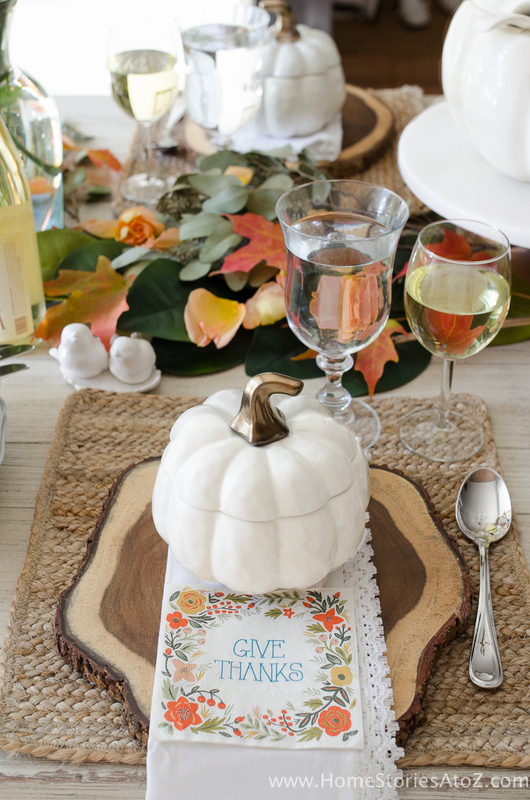 Here are a few helpful Thanksgiving table tips! Serve a fall soup before the main course. Feeding a crowd can get expensive. If you are trying to manage the cost of feeding a crowd, consider serving a fall soup before the main course. I love to serve butternut squash bisque or cheesy cauliflower soup in the fall. Both recipes are easy and affordable to make and will fill up your guests. 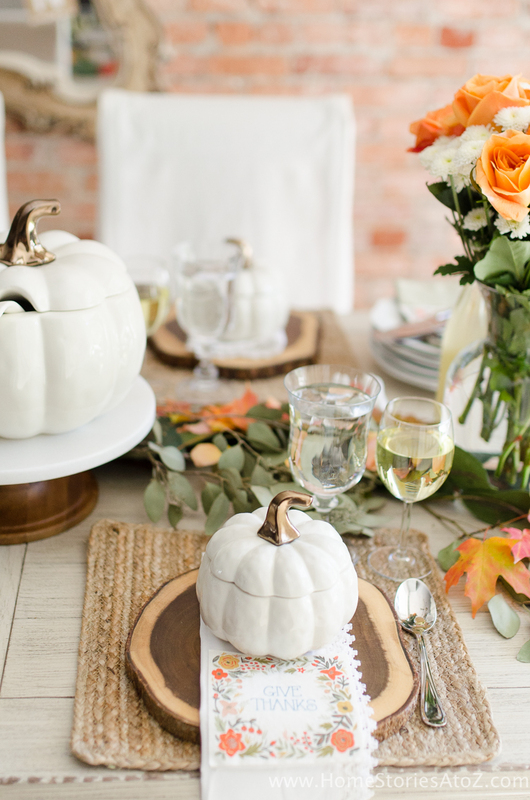 And with all that money you’ll be saving on meat, you can go ahead and splurge on these ADORABLE pumpkin soup bowls ! They may currently be sold out online, and if so I recommend you sign up for the “in-stock alert”. Priced at just $24.99 for six (approximately $4.17 a bowl) makes these a seasonal steal. I just love them! Don’t be scared to use paper napkins. 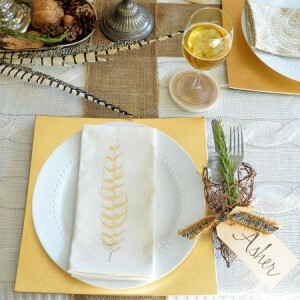 I love to use cloth napkins for special holidays, but let’s face it. Getting gravy stains and cranberry dressing out of cloth napkins is a total drag! 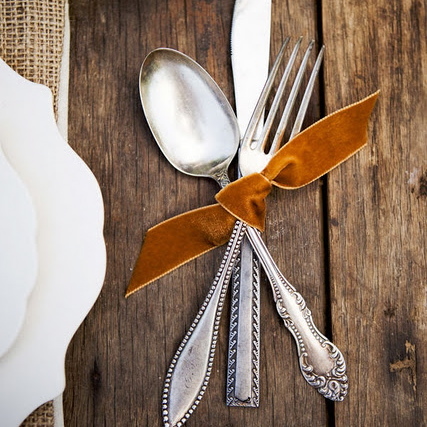 I’ve found that providing a decorative fall paper napkin over the cloth napkin not only adds to the table decor, but also encourages guests to wipe their messiest messes with the disposable option. 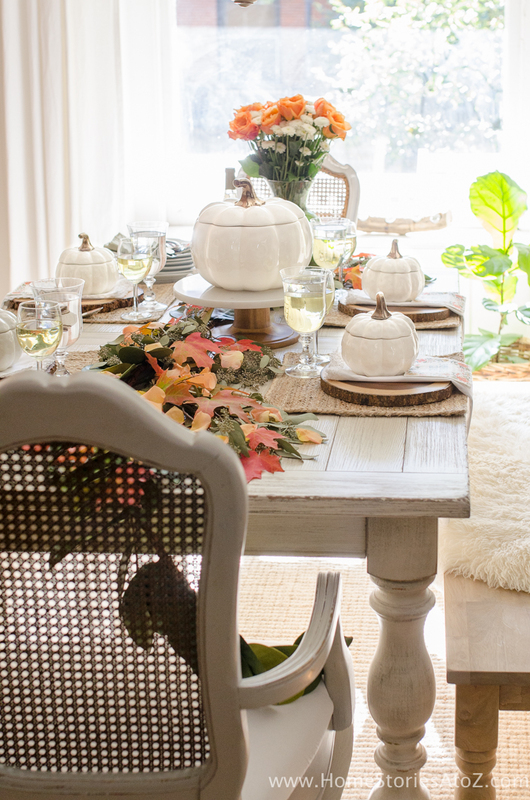 Keep the centerpiece below eye level. Nothing is more annoying than not being able to see your friends and family across the table because a tall centerpiece or candlestick is obstructing your view. Tall centerpieces are lovely, but they get in the way of conversation. 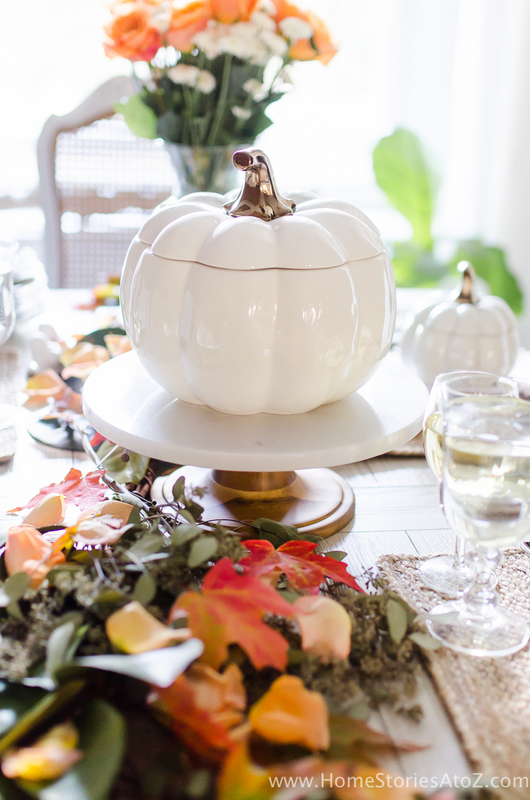 Keep your centerpiece fuss free this year with a cake stand and decorative dish. 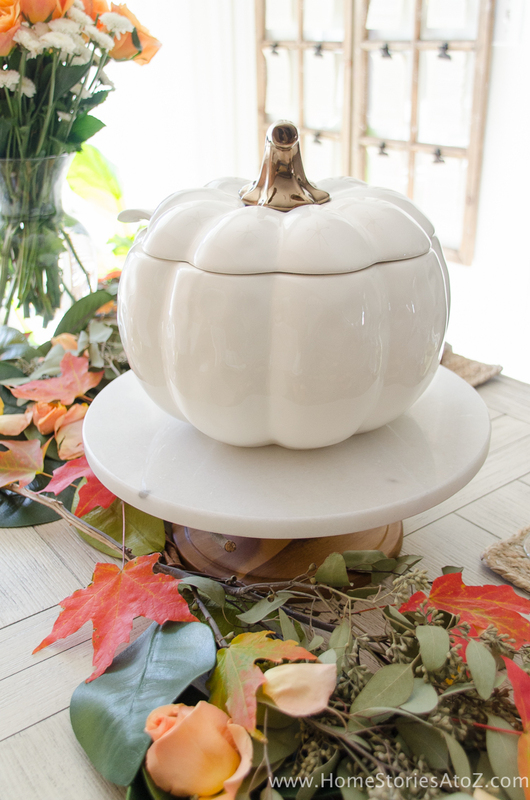 I used the Better Homes and Gardens Acacia Wood and Marble Cake Stand topped with the Pumpkin Soup Tureen. 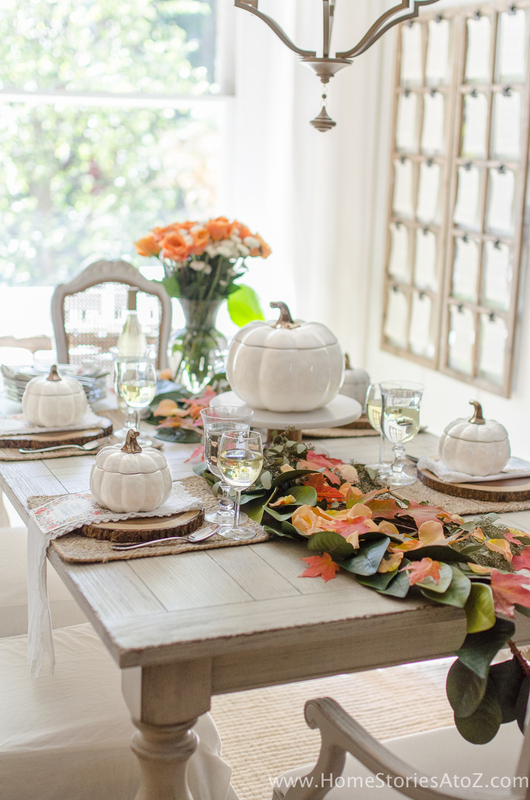 When your serving dishes are pretty enough to double as a centerpiece you know you are winning! Create a runner with natural elements. 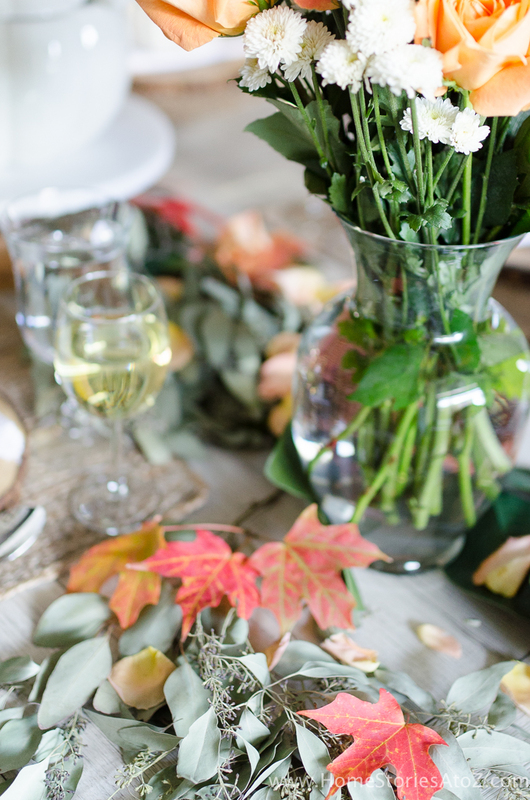 Instead of using a cloth runner, create a garland using natural elements. For this runner, I used two faux magnolia garlands, some dried seeded eucalyptus, rose petals, and some fall leaves. At the end of the table, I placed a vase of grocery store flowers which complement the runner beautifully! Keep courses casual with stacked plates. 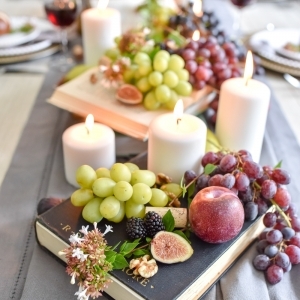 Depending on the size of your Thanksgiving crowd, keeping a stack of plates at the end of the table for each course can help contain clutter and give a cozy-casual feel to the occasion. 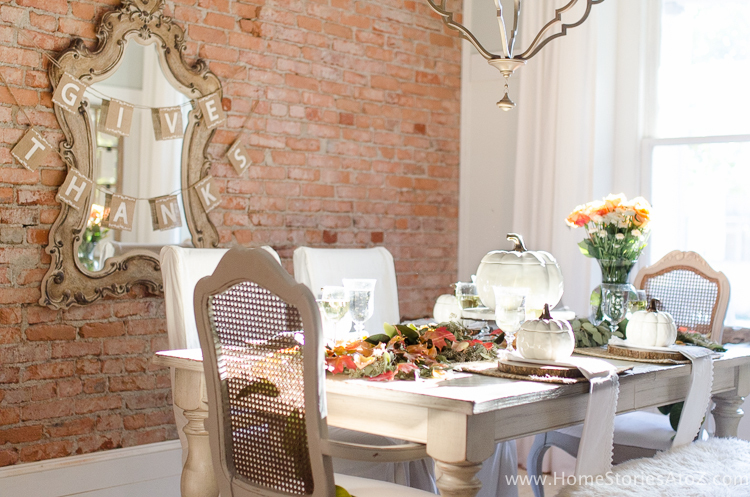 I love the Better Homes and Gardens Scalloped Dinner Plates. They have quickly become my favorite everyday plates! 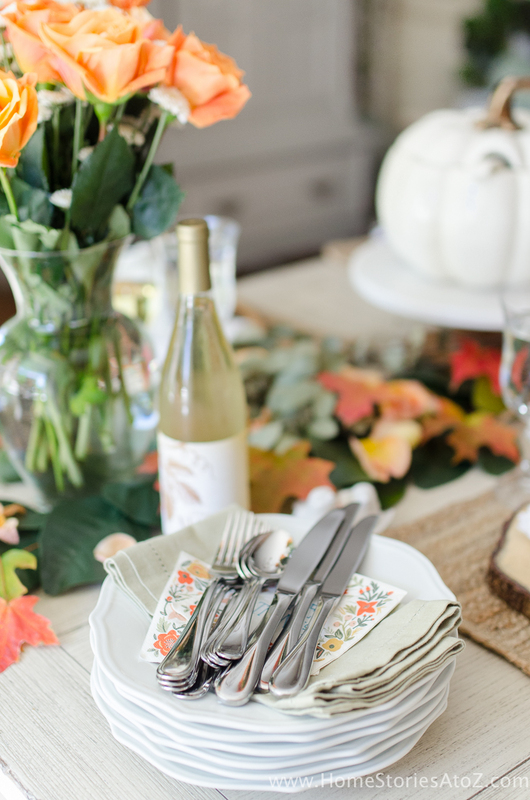 I hope you enjoyed my Thanksgiving table tips! 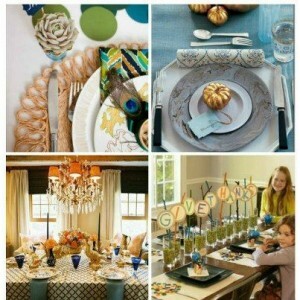 Check out the related posts below for even more Thanksgiving table ideas. 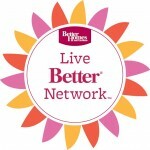 Follow Better Homes and Gardens Live Better Network on Facebook, Instagram, Twitter and Pinterest. Oh. My. Goodness. 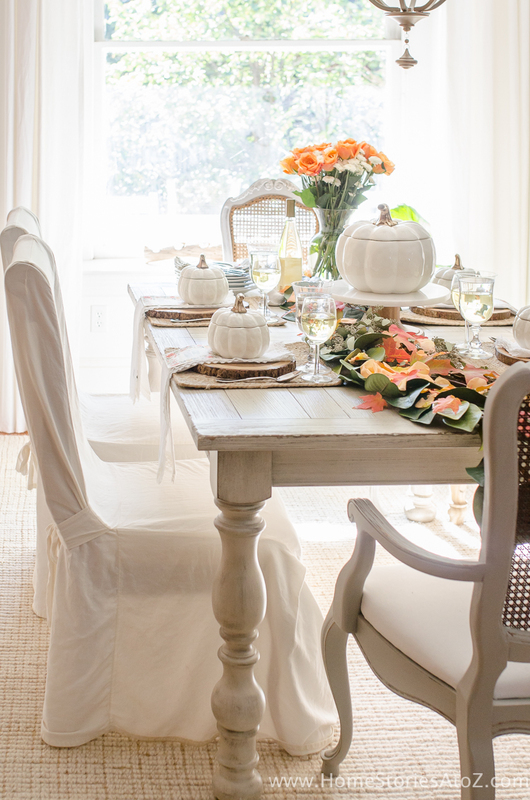 I love all the brightness in your dining area! And I love the pastel-ish theme of fall colors! It’s so calming. Is that a real brick wall? What a find!!! It’s like finding real hardwood under carpet – what a treat!! I know, right?! It’s really my favorite thing about our little house and definitely the thing I’ll miss the most when we move. That will be a fun adventure! We don’t know if we will move or not, but we’d like to get out of the city for a bit. I love where we live but my kids would love a more suburban experience now that they are older. 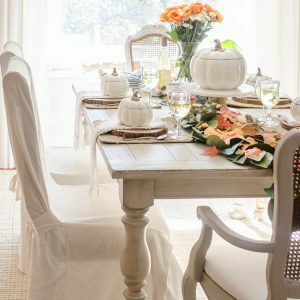 Hi can you tell me where he dinning table is from Thanks! 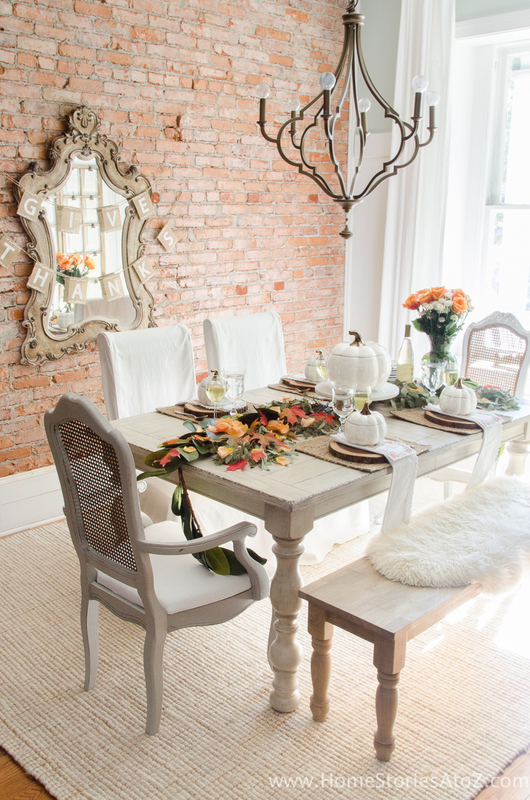 I adore this table and decor. Simply beautiful! The table simply gorgeous! And simple being the key word! 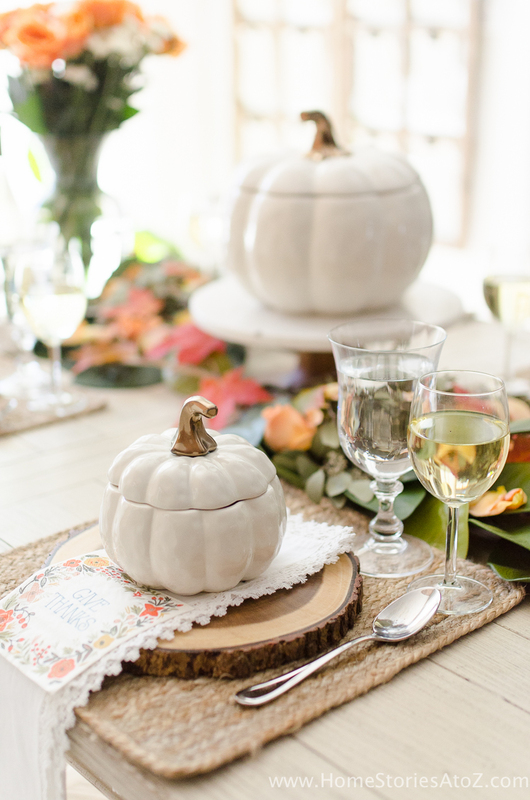 It’s the perfect amount of decor and touches of festive fall colors and those little pumpkin bowls are just too cute! I need to pick some up asap! Beautiful and colorful! 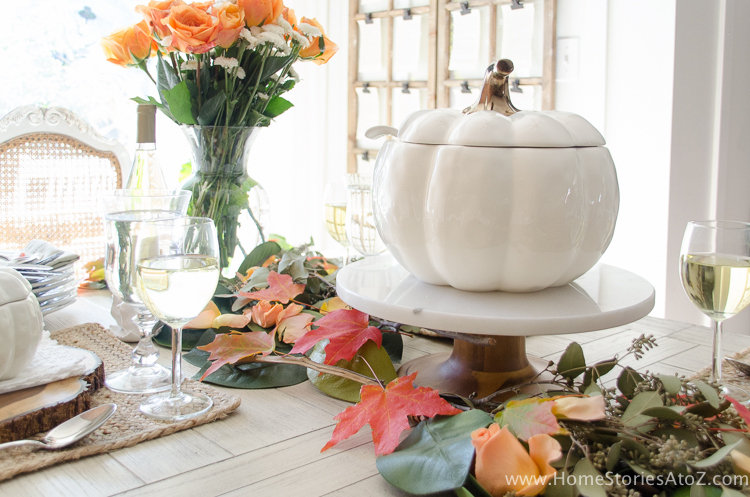 I love those pumpkin bowls- wish I would have snagged them when they were online. They are so cute! I love them. They hopefully will come back in stock online. I’m coming to your house for Thanksgiving, so pretty!